To celebrate Bitcoin Wednesday’s 3-year anniversary on 6 July 2016, Martijn Jeroen van der Linden will give a presentation about innovation of the financial-monetary system of the future. In 2o14 Mr. van der Linden, a researcher at TU Delft’s department of Economics of Technology and Innovation, gave one of the most interesting talks we’ve ever had during Bitcoin Wednesday, and we’re honored to welcome him back. According to van der Linden, the financial-monetary system will change radically in the coming decades due to technological advances and the call from a growing segment of society for new economic systems based on different values. During Bitcoin Wednesday he will first briefly explain the history of money and how the current monetary system works. Then he will discuss practical monetary innovations, monetary reform proposals like “central bank-issued digital cash”, “sovereign money” and the (theoretical) purposes of money. Mr. van der Linden is a researcher at the EU project Creating Economic Space for Social Innovation and a PhD-candidate at TU Delft. His thesis is concerned with the purposes of money and the design of the monetary system. Before coming to TU Delft Mr. van der Linden studied Business Administration at the University of Tilburg and worked for 5 years in the financial sector. Since 2009 he has been exploring the viability of new economic systems and business models. He regularly lectures and advises startups, is a board member of Stichting Ons Geld and Casco Projects as well as a co-initiator of Burgerinitiatief Ons Geld and De Grote Transitie. 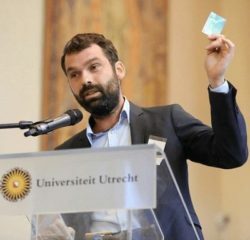 His citizen’s initiative brought a debate on the monetary system to the floor of the Tweede Kamer in March 2016 which resulted in a vote in favor of research into the monetary system to be conducted by the WRR, The Netherlands Scientific Council for Government Policy.